Susie didn’t mind playing the cops and hookers game, an unavoidable situation for a working girl. She would come out no worse for wear if she only played by the rules. She had learned to be friendly but respectful, even a little playful at times, and she knew to give the cops something they didn’t have when they called her over. Nothing happens on the street without these girls seeing it, hearing about it, or being directly involved in it. They know who peddles the dope, who runs the guns, who whacked the last guy, and who is getting whacked next, and why. If a girl wanted to stay on the street making her money, she would need to provide information to the cops from time to time. I am always extra-eager to talk to people with real-life experience in the worlds they write about, and so I am delighted to bring you an interview with former homicide detective Danny R. Smith. Danny brings the fellowship of the squad room to life — as well as the banter and dark humor that take the edge off of the hard and often grisly job. And if you sign up for his newsletter (follow the link and scroll down), he will send you a free short story, so you should absolutely go check him out. No worries; I’ll wait! 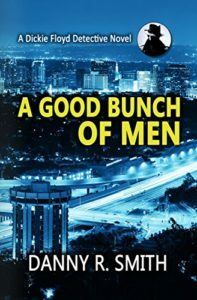 Danny’s first book, A Good Bunch of Men, introduces the characters and partnership that makes up the team known as Dickie Floyd. 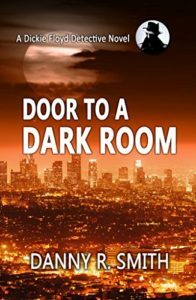 His second book, Door to a Dark Room, which was being finished as this interview was recorded, is available for pre-order as this goes live. I also want to mention Ellen Kirschman, whom I had the pleasure of interviewing here, and whose work I mention because both she and Danny write about cops and police psychologists, but from the opposite perspective. In their novels, they each approach that relationship with an understanding of how difficult it is for trust to form. I find it fascinating to glimpse this world from both sides, and from people with first-hand experience. Plus I love both of their writing! Check out Danny’s blog, particularly if you’re a fan of true crime or are looking for the story behind the story. As always, if you’d rather read than listen, the transcript is below. Enjoy! 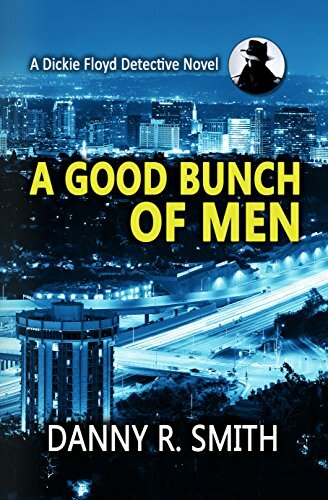 Laura Brennan: Danny Smith is a retired homicide detective, current private investigator, and author of the Dickie Floyd mystery series about a pair of veteran Los Angeles detectives who couldn’t be more different, or better-matched. Danny, thank you for joining me. Danny R. Smith: Good morning. Thank you for having me, Laura. LB: The two heroes of your series are Los Angeles homicide detectives, and that was your old beat, wasn’t it? LB: How did you end up going into police work? DS: Well, like many young men, I was kind of lost and not sure what to do. And I landed a job working security through a friend who said, hey, this is a great job while you’re going to college, you can work the graveyard shift and do your homework while you’re working, and it pays pretty good. I think it was like, $4.50/hour back then. The two heads of security were retired LAPD officers and I just fell in love with these guys. These were men’s men, the stories they told, the way they walked, the way they talk, the way they looked at people, the way they joked with people. Everything about these guys, I just loved. These two guys were just great guys, and that actually is when I first started thinking, man, it’d be great to be a cop. LB: Well, that’s really interesting because one of the things you capture so well in your novels is the sense of camaraderie. DS: Yeah. The debut novel, A Good Bunch of Men, the two main characters are based on me and a longtime partner and best friend. His nickname is Floyd. I named him that about 30-some years ago. He’s just one of these guys, he’s extremely well-liked, he’s extremely attractive. He’s a ladies’ man. Women go crazy for him. He’s fun, he’s athletic, the guy’s just phenomenal in all the ways. He kind of goes through life with that “everything’s easy,” he doesn’t get stressed, he’s just one of those kind of guys. And a real tough guy, too. But I named him Pretty Boy Floyd just because of his looks, and it stuck. Even to this day, people call him Floyd. We’ve even seen subpoenas come for him under the name Floyd and his true last name, because some people didn’t even realize it wasn’t his real name. So it stuck, and that’s always been the case, and he likewise had always called me Dickie, we don’t really know why. Because that’s not my true name. LB: Before we talk about the book itself, if someone hasn’t picked up A Good Bunch of Men yet, what do they need to know just to be able to follow our conversation? DS: These are two LA Sheriff’s homicide detectives. A lot of people, first everyone thinks of LA cops as LAPD. LAPD is a very large agency, but they are also just one of many cities in the county of Los Angeles. And the Los Angeles County Sheriff’s Department is a 10,000 sworn personnel department, a very, very large agency, and the LA Sheriff’s Homicide Bureau is kind of the big leagues of the detectives throughout the department. So I spent my career working in South Central Los Angeles, from there I promoted to station detectives, and that was my introduction into investigations. From there I was able to work into a couple of specialized details such as the Crime Impact Team. I eventually promoted to Detective Division and eventually went to Homicide. And I tell you all of that so that people can understand, the homicide detectives with the LA County Sheriff’s Department are an elite unit. There’s a lot of freedom. You and your partner pretty much can do whatever you need to do because you don’t get there as a slacker. The people who make it to homicide are pretty much self-motivated, self-starters, and your lieutenant does not need to find out whether or not you’re working or not. He knows you’re working because you’ve got a big caseload. So it’s a very unique position within law enforcement. LB: What made you decide to turn writer? Because it’s not as if you were slacking off in your retirement. You actually are private investigator. DS: I retired early on a medical. I got hurt, had have a couple of neck surgeries and I was retired early. Now I’m really lost. I was 42 when I retired — and clearly way too early to be retired. I hadn’t ever planned to retire, so I didn’t have any idea about what to do for a second career. But I always loved writing and while I was trying to decide what to do with the rest of my life, and while I was off after the surgeries and didn’t have a lot that I could — I was very limited in what I could do with my life for a year. So I started writing. I wrote fiction. The first book I wrote, I based it on some of my experiences. And I thought it was okay, and then I started wanting to take it a little more seriously, so I went to few writers conferences. I met with some editors and agents, and basically had my work torn up with a red ink pen and learned that just because you’ve have written professionally for all of these years — meaning reports and affidavits and all of that — doesn’t mean you know how to write creatively. And that was a big wake-up call for me. I was like, oh, yes, that makes a lot of sense. So I immersed myself in studying the art of creative writing. I wanted to learn to write better and that first book was basically thrown away. And then I started this book, A Good Bunch of Men. So I wrote the book and Floyd is still working. I send him chapter by chapter because Floyd loves Floyd and I know he’s gonna love this book. I start my business as a private investigator, I get some new direction in life and I start that business, and it pulls me away from writing. The business has been running now for about 12 years and it’s been very, very successful. About two and a half years ago, my old partner Floyd was diagnosed with a terminal cancer. They gave him six months to live. So he asked me, hey, what did you ever do with our book? Because that’s what I was called it, “our book.” And I said, well, I never did anything with it, why? And he said, I’d like my family to be able to read it. And of course that hit me like a cannonball in the gut. I was like, oh, man. I said, well, okay, I’m not going to email someone a PDF. Let me finish it and get it published. And I think all writers go through this. I went back to look at this book and I just really wasn’t happy with the way it was written. So I pretty much rewrote the book. The plot was kind of the same but it really evolved. And I also really stressed myself doing it because I wasn’t sure how much time I’d have. I finished it, I published it, I had it done in time, and I was thrilled about that. I printed it out one time when he was really, really struggling and it was my final edit that I was doing. I worked on the editing while I was sitting with him. I spent a week down there and I was at the hospital all day, every day. And on the few occasions where he was alert, I would read to him. He would smile, and it was just really, really something special; I knew that he enjoyed it. I would tell him, hey, it’s just about done, I’m going to get it published. I did it for him and for us, and the next thing I knew, the word was spreading, primarily through the department and our friends and family. I expected to maybe have 20 books out there in the public, and pretty soon it’s 100 and 200, and it just keeps going. I was kind of shocked by it. But my love for writing had been rekindled. Now the best part of this whole story is, two and a half years later and Floyd, the cancer is in remission. They gave him six months to live two and a half years ago and he’s back to living life. He’s riding a horse now. I mean, it’s a miracle and it’s a wonderful part of the whole Dickie Floyd story. LB: I love that, and one of the reasons I love that is that the heart of your story is in fact the relationship between the two partners. Underneath the hard time to give each other, there’s a real affection and trust which comes through every time they’re together in the book. DS: Yes, and that’s what a lot of people comment on. The people who know us, their comments are, my god, you couldn’t have written it any better. The people who don’t know us but are involved with law enforcement just talk about the authenticity of the book. Without a doubt, the relationship between those two partners as portrayed in the book and in real life was one way or, I mean, we used to actually kind of joke that we were one another’s alter ego. The reason Dickie Floyd even came up, a guy we used to work with would start calling us that collectively. Like he would see us and go, “Oh, there’s Dickie Floyd. How’s Dickie Floyd today?” The truth is, we would be able to communicate without even speaking. I could glance into his eyes and he in mine, and we knew we were on the same page — and I’m talking about in life-threatening situations this would happen. We were just always, it was like a right hand and a left hand. You didn’t have to try hard, everything happened naturally and flowed smoothly. It was a dynamic relationship, and it really gives it a different feel for this book than other crime fiction books because it is so authentic. LB: One of the things that is — you know, it’s a cliché, but it’s a cliché because it’s true — is how hard being a police officer is on relationships. LB: That’s true with your hero, Richard, too. DS: Correct. In my, in Dickie’s real life, he’s only been married once. He’s still happily married. I joke all the time that I have a trophy wife. She’s just fabulous and I couldn’t think of a better person in the world to marry. But in the book, he’s the one with several divorces and whatever else. It’s not a true story, it’s just loosely based on — the main thing is the personalities. You know, I was the workaholic and the stressed-out guy that was always, the ultimate A type personality and he was like, yeah, whatever man. LB: I want to stick with the idea of relationships for just a minute because one of the relationships in the book is Richard’s relationship to his psychologist. One of my other interviews was with Ellen Kirschman. And Ellen Kirschman writes a series about a police psychologist because she was one. LB: So she, on her end, talks about how difficult it is to get the police to trust the psychologist because they think they’re working for the other side. And you touch on that from your hero’s point of view. So tell me a little bit about how fraught that relationship is. DS: You know, cops just don’t like to open up to anyone. Thankfully, I believe that we are evolving — we, law enforcement, are evolving. There was a time where cops would never talk about weaknesses and fears. Even sitting down with a shrink as we call them, most cops just wouldn’t open up. In the book, I definitely played to that and in the sequel, she comes back. That relationship, yes, it was a very tense one. Richard felt like he could talk to the shrink a little bit, kind of give her little bit, but he didn’t want to open up because he knows, as most homicide detectives do, but some of our thoughts are really troubling. And you’re not sure what that means. You’re not even sure it’s okay. I’ve learned it’s okay because, especially when I left and I was diagnosed with PTSD, I went through a lot of counseling because I felt like, hey, there’s a lot of baggage here. You can’t spend a career standing over dead people and not come away with quite a bit of baggage. And what people don’t realize is that the things that happen in a person’s brain subsequent to those experiences make you question yourself. In the book, as you noted, we’re constantly joking about, are we not? Well, we’re not nuts compared to that guy. But truthfully we all feel like, gee, yeah, we probably are a little bit nuts. So that’s kind of how that relationship evolves in the first book. LB: Well, it’s a tough job. It’s certainly not a job that most people could do. DS: No. Police work in general is an extremely tough job and not a job that everyone can do. And then being a homicide detective in a major metropolitan area is tenfold that. Yes, it’s a difficult job. Very high stress. LB: You have a great line in A Good Bunch of Men where you say how a homicide detective doesn’t just look for what’s there, he tries to figure out what’s missing. DS: Yes. So, you know the crime scene for many homicide detectives, there’s a real reverence to the crime scene itself. That’s where it all starts. To be a good crime scene investigator is the goal of every great homicide detective. There’s more to it than investigating a burglary or robbery or any other crime because you are there to speak for the victim. The victim, it’s — that’s over. Without an eyewitness, which most homicide cases are not witnessed or you have a difficult time locating the witnesses or the witnesses just won’t speak to you. So the crime scene is where you start trying to put the story together. What is imperative is that you read it correctly. The crime scene is a story and it’s to be read correctly. We have a lot of experience in investigating crime scenes, death scenes, because we don’t just go on homicides. We go on every, we go out and look at every death case that there is that’s not a natural death. If there is not a doctor to sign the death certificate, then a homicide detective is sent out to look at that particular case. Let’s say it’s a suicide for example — to make sure it’s not a cleverly disguised murder. Do you really gain that experience and you learn to read crime scenes, and of course you have a lot of training and you work around people that are far more experienced than you. LB: Based on your years of experience, what do you think is the most important factor of whether a crime is going to be cleared or not? Whether you’re going to find the guy who did it or not? DS: If I had to guess, I mean, just off the top of my head I would say probably the motive. When you have a motive that involves gangs or drugs, the likelihood of solving that crime is extremely low. And the reason why is because gang members and drug dealers don’t talked to cops. I’ve handled numerous murders where the murder was witnessed by family members of the victim and they wouldn’t tell me. They know who did it and they just aren’t going to tell you. Crazy as that sounds, that is absolute. Any homicide detective will tell you that. So probably motive, yes. Depending on the motive of the crime, that’s a big factor in whether or not a crime can be solved. When you have a domestic murder, of course that puts you in the much higher realm of being able to solve case because quite frankly outside of drugs and gang activity, most people are killed by someone that they know. You have a better starting point and you will generally have better sources of information as you’re speaking to various family members. The way you start a homicide investigation after the crime scene is you want to learn as much about the victim as you can. Because you have to know how that person lived in order to determine how and why they died. The answer usually lies in there somewhere. So with the domestic case or a neighbor dispute, as you start — I like to call it wearing out shoe leather. As you’re going out and talking to people and knocking on doors and interviewing anyone or everyone who is part of that person’s life, you’re going to start unraveling the mystery. There’s going to be things that are presented to you that are going to make you say, oh, okay. That’s interesting. A history of abuse or previous dispute… Whatever it is. Those types of cases are far more likely in the solve category. LB: You have a new book coming out. DS: I do. It’s the sequel. I have a third book and I decided to put that on the shelf because A Good Bunch of Men became so popular and people seemed to like it so much that I have a lot of encouragement to write a sequel. So I shelved the third book which was completely different and had completely different characters. The third book is still about a retired homicide detective, but it’s completely different. It’s a very different book. So I put that on the shelf and then I wrote the sequel, and in doing so I introduce the main character of the third book into the sequel so that it can tie in. I think it’s going to be wildly popular. I actually, the third book, I hate to say it but I think the two main characters in that book are made-for-TV. Some people say that the Dickie Floyd partnership is, and to a degree I would say yes, probably. I mean, maybe late-night TV. But the third book I think is going to be even more fun. LB: You are working on a sequel. What is it called? DS: So the sequel is, it’s a working title but I’m pretty sure it’s going to stick, and that is Door to a Dark Room. The reason I like to preface it as a working title is just because the first draft is finished and now the hard work begins. I think probably a lot of writers do this, is that while you’re going through your book, sometimes there’s just something that pops up that would be a great name for the book. And Door to a Dark Room is what popped up when I was writing the first draft and I think will probably stay, but I just don’t know. LB: So, in this sequel, it’s still your heroes, Dickie Floyd. DS: Yes, although it’s quite a bit different. So without giving away A Good Bunch of Men, at the end of the book, Dickie is injured and he’s gone for a while. So the sequel picks up a year later with Dickie returning to work, and there’s a lot of baggage there that people will find interesting because there’s a lot that goes on and it plays to what we talked about earlier with the psychological issues and fears, insecurities, whatever. And a lot of that comes out in that second book. So Dickie returns to work and in the first book, I’m sure you noted that he and his captain did not get along very well. When he comes back, Floyd is now partnered up with a new guy that he’s training, and Dickie feels like he should be able to just walk back in and hook back up with his partner because that’s like a marriage made in heaven. And that doesn’t happen. However he, Dickie, gets involved in a very interesting case that the person who has the handle on it, the murder happened just before Dickie returned to work, and the person handling the investigation is without a permanent partner. So Dickie steps in and starts working with him. And because it has the markings of a serial killer and because a lot of other things start happening rather rapidly, they need to put together a little bit of a task force. So Dickie pull some strings and the captain actually allows Floyd and his new partner to join this task force. So they’re still together but not in the same, intimate setting. Because I couldn’t get rid of Floyd, but he has a lesser role. I also felt like it would be a fresher book and not just more of the same. It’s a very, very different book, the second book is. LB: And I like that, too, because one of your things about Dickie is that he is always looking for the serial killer angle. DS: Oh, yes! Yes, he constantly — and Floyd would always tease him. Every case is like, oh, yes, I’m sure you’re just convinced this is a serial killer. Because that was his thing. It’s like, man, I just want to work a serial killer case, is that too much to ask? LB: You also write a true crime blog. DS: I do. I write a weekly blog and it’s mostly true crime, although I have to tell you, and I don’t know if you’ve been following it lately, every once in a while I throw something in there, I did one on Valentine’s, I recently did one about raising your daughters to date, preparing your daughters for dating. And every once in a while I throw that kind of stuff in there so that everyone knows that Dickie is a big marshmallow, you know. He might look tough but he’s just a big softie. And I think people like to see that side because it’s not outwardly apparent. It’s behind the scenes, so to speak. And I do like to write, other than just crime. But most of the blog is true crime, some war stories, highlights of some cases and all of it is geared toward when I finish these next two novels, I am going to start writing true crime. I’ve got some of my most interesting cases that I know will be great books and I think will be very compelling stories to be told. They should be told. So there’s going to be a shift here going on in the next year, Laura. LB: That’s very exciting. Very exciting stuff. Where can people find you online? LB: Thank you so much for joining me today. DS: Thank you. I really enjoyed being on your show. I had the pleasure with reading A Good Bunch of Men. I loved the book and immediately found a new author on my must read list. I am anxiously waiting for A Door to a Dark Room. This is an excellent podcast. The interviewer asked important questions. I have to send this Podcast to my friends. Thank you for interviewing Danny Smith. I’ve been following his blog and read his first book. However, your interview gave the readers an inside view on personal issues of the job…looking at dead bodies and trying to figure out what happened or hoping they will ‘speak’ to you. I have law enforcement in my family from K9 to Chief of Police, it’s a very difficult profession in very difficult times. I can’t wait to read Door to a Dark Room….counting the days. Thank you again and I hope you have him on again…very entertaining.